You could argue which one of Michael Jackson's items of clothing is the most iconic. Some would say his glove, other's might go with his Black Fedora or even his white fedora from the Smooth Criminal video. 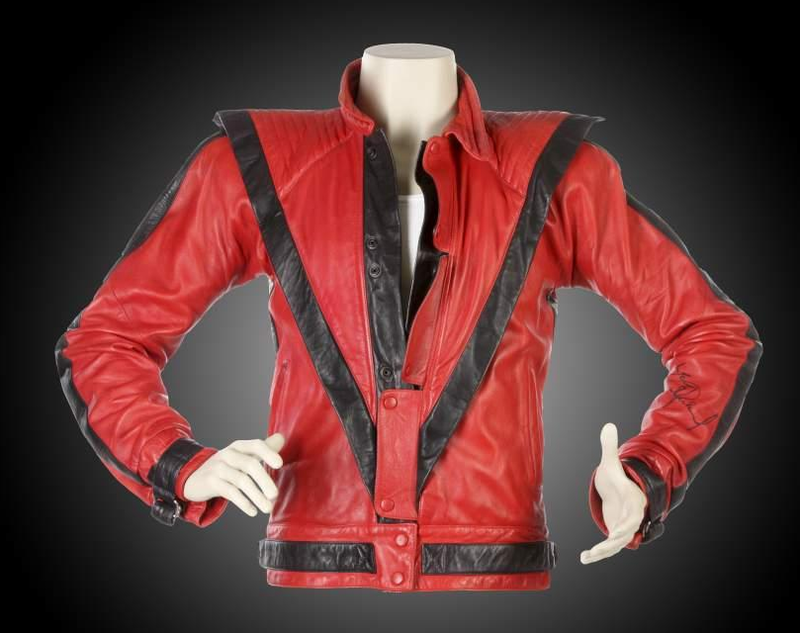 Perhaps its the black shirt from his Scream video with his sister Janet Jackson, or one of his Military styled outfits, or the red jacket you see pictured above from his Thriller video. But why argue about it when you can own them all. It would take a lot of money, but someone could walk away with all of these items. These and other iconic pieces of music memorabilia are going to auction. Julien's Auctions has over 600 items available June 25 and 26 and represent over 100 artists including Michael Jackson, The Beatles, Eric Clapton, Madonna, Frank Sinatra, Bruce Springsteen, Elvis Presley Justin Bieber and Lady Gaga. Can't afford the close to $500,000 expected selling price for the Thriller Jacket? 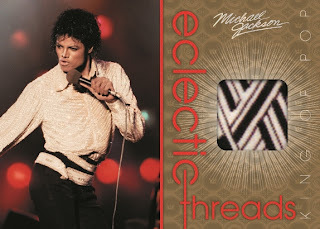 You can always try for a small piece of Michael Jackson's wardrobe as Panini goes live, tomorrow, June 8th with their release of the Official Michael Jackson Trading Card Set. We've covered it here on the blog before. For more information about the Auction use this link to get to Julien's Auctions. For more info on Panini's Official Michael Jackson Trading Card Set, use this link to get to The Knight's Lance.